01 - What are Life Recipes? Life recipes are practical methods and meditations to guide us into being more present, connected and happy. 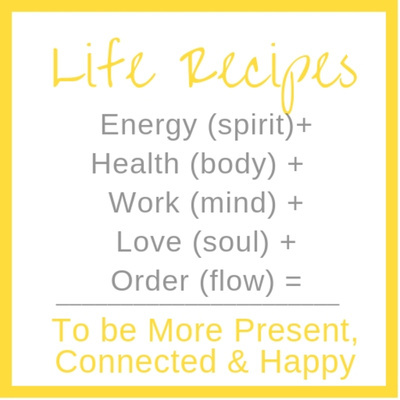 By following life recipes—in as little as 5 min a day—we connect to our spirit (energy), health (body), mind (work and service), soul (love and relationships) and flow (by creating order). Taking this time to connect within and be in the stillness helps us create the harmony, wholeness, and abundance that is our essence awaiting to be tapped into. Just like a food recipes make cooking easier, life recipes make connecting within easier. We can use our breath at any time to tune into this moment, the present and feel the peace and calm that is within us. The more we practice meditation and body awareness and being still the more easily we can see when we’re not in this place. We recognize when we’re in a reactive agitated and stressed place and we have the tool we need to get back to presence. Allow this meditation to calm you, create stillness and calm, and become present. So you may show up with the love kindness and peace that you are at your core. Wealth actually means well-being. We’ve begun to narrow the definition to refer to bank accounts and material objects. Yet spiritual wealth is so much more. Material wealth alone does not give us the contentment, fulfillment and level of well-being we desire. Wealth is a spiritual well-being that is within each of us and in flow with creativity, life, love, source. Like wealth, prosperity is way of being and thinking that is transcendent. Eric Butterworth says “Prosperity comes from the Latin root which translates to: according to hope. Or to go forward hopefully. It’s not a condition in life as it is an attitude. Prosperity is a way of living and thinking and not just money or things.” We have been conditioned to think life is what happens around us and to us. Yet, life is lived from the inside out. It’s not what happens out there it’s what we do or think about what happens. Starting point of prosperity (or going forward hopefully) is accepting responsibility for our thoughts, keeping ourselves in the positive stream of thoughts, centered in abundance, sufficiency and well being. It’s within all of us, our essence. Listen to this to allow yourself to pause, breathe and reconnect to your prosperity thinking and being and experience all the good that comes. We have to actually design our life for health if we want to be healthy. It just takes a little planning, making a commitment. We live in a world where everything we need or want is at our fingertips - and we can use that for us or against us. Yes, there are unhealthy choices lurking everywhere. But there are healthy ones too. We have to seek them out. We are traveling and the food being served is really unhealthy. The easy choice is to just eat it and then feel bad in your body. The other choice is to plan ahead. To have some mixes for shakes to look into some food delivery options nearby of healthy choices. It comes down to what our plan is. We have to plan because if we leave it to indecision and will power. It won’t work. If we’re relying on willpower, that means we haven’t fully determined what you want. We haven’t made the commitment. And in that case we will easily be swayed toward the shiny object, the oooey gooey delicious that is right in front of us. Yet, we know there is far greater fulfillment in achieving the big vision of what we want and we desire. Saying no in the moment when a temptation comes up is easier when we have our vision in mind and we can see that saying no means we are saying yes to something much better, something in alignment. The reward is far greater than the instant gratification of what looks good right now. You have to make the commitment and and design your life for it. Are you really serious about this? Or are you just talking? If you are still on the fence and going to rely on will power, it’s probably not going to work. Research shows that will power is actually a finite resource within us. It won’t last. However, when we make a decision, there are infinite resources that come back to us. The internal debate is over. We have to choose to stick to your decision. Listen for the steps to do it. Too often we react to what’s going on around us and often it comes from a place of fear and anger and negativity. We can create some space between what’s happening, our experiences and how we choose to respond. Shawn Achor says “It’s not the reality that shapes us, it’s the lens through which we view realty that changes our experience of it and our ability to create a better world for other people. Happiness doesn’t stop us from change. It’s gives us the belief that change is possible.” It’s not about what happens, it’s the lens through which we respond. We can choose differently and it helps the connections we have with the people around us. And in the end isn’t that what is most important, how we are connecting. The connections we make through the interactions we have. We can choose to make those happy from a place of love that is within each of us. Too often we run a story in our head that is against us. Why is there something within us that is against us? Maybe from our experiences, the wounds we carry that lead us to believe we are not good enough, that we don’t matter, that we are not loved. This isn’t our truth. We can see the meaning in our story and create a new story knowing that all of our experiences made us into who we are, unlike every other and hear to serve in a way no other can. But we have to show up and see the light love and life within ourselves and then we see it all around us and in others. So use this meditation to bring awareness of the story you are telling yourself and to create a new one that is filled with the love peace and joy that you are. Awareness is the first step toward feeling that great power of presence where we can flow in our lives. Awareness helps us become conscious of the story and the thought we are telling ourselves and we can change. When we’re in a place of not knowing the next step to take. It’s easy to stay where we are, where it’s safe and comfortable. But that’s no place to be. We can change the lens for how we experience this time of uncertainty. We can look at it with gratefulness, choosing to see abundance in the opportunities that lie ahead. It’s at this time we just need to take the first step. It all seems big and moving forward feels hard. We may be in a place of worry or fear. We can accept that and choose to feel gratefulness for choices. That we have choices. And it’s at this time we need to turn within. We’ve been given so much direction from the people around us, our families, the media, they try and tell us what is the next right step for us. What will bring us the joy and fulfillment we desire. But it only comes from within. That’s where the answers lie. We have to take time in the stillness in quiet, in stillness, walking, in nature. This is when we can hear the whisper that is guiding us along. We see the flow in our lives as we look back. We can feel it now too. We have to listen. Let this meditation guide you and inspire you to go within and fine peace in the indecision and courage take the first step forward to something that is right for you, that feels good in your heart. Everything up until this point had meaning. It lead me to where I am today. Even the hard things are teaching us something - creating an opportunity to grow into who I am meant to be. Too often we get caught in a negative storyline of us not being good enough, worthy enough, not being happy. This isn’t true. We can affirm that there is a flow to our lives. Each one of us has a unique flow, that is why looking outside of ourselves will not bring that fulfillment we all desire. It only comes from within. We only manifest on the outside what we have inside. Listen to this life recipe to affirm acceptance for where you are now and connect to that part of you that is only found through presence. Where we are right now is perfect. When we are in this positive space, more good comes to us. Take a moment to listen and express thanks for where you are. For all the ups and downs that got you to where you are now. I accept where I am now. We often think of meditation as sitting in quiet. However, It is simply training of the mind and something we can practice all thoughout our day to feel more wholeness and harmony. We have learned how important it is to cleanse our physical bodies. Everything from moving our body, to showering, to brushing teeth. We understand and grasp that. What isn’t is widely known and practiced is that its just as important to cleanse our mind, spiritually and emotionally. And meditation is one tool to help us do this. Meditation is not just relaxing and slowing down our thoughts. It prepares our mind to be more adaptive and less reactive. Listen to this to learn how you can incorporate meditation into your day and begin feeling more present and tuning into our essence that is joy love peace within all of us. 15: Meeting and accepting others where they are- affirming the light in you is all I see. One of the greatest human needs we have is to know we are being seen, heard, and accepted as we are. When we encounter people, we may not like the way they are, how they are treating us. That may be someone on the street we don’t know or someone close to us, a loved one, even our child who may always press our buttons. It’s helpful to remember always people act on the outside the way they feel on the inside. When someone is acting very horribly, they are hurting inside. And feeling even worse when they do that horrible thing to another. We can choose to show up differently, we can choose love. And to affirm the light in you is all I see. It’s especially helpful with our children as parents. There is an acronym called HALT that I’ll talk through that helps us be with our children on their tough moments. Hungry? feed them. Angry? Give them some love. Lonely? Give them some attention and one-on-one time. Tired? Give them space to rest and experience quiet. We all have an inner child that wants to be seen, heard, and accepted. So this acronym helps in all our relations. Choosing love and choosing to see the light in another is the best thing we can do in helping another person move through a challenge. Today choose to meet and accept people where they are and affirm: the light in you is all I see. Allow this meditation and body scan practice to center and ground you. We know gratitude is the gateway to joy and peace. We are whole and perfect and complete right now. Through our breath and focused awareness on our different body parts, we express gratitude. This calms us and allows us to feel peace and thankfulness for what is going right and trusting that what appears to be going wrong is here to help us grow. As we affirm and trust that we are whole, perfect, and complete we begin to notice all there is to be grateful for. Thank you for this practice and affirming gratefulness. Peace begins within. We can use our breath wherever we are triggered or feeling resistance or frustration or any negativity. We return to this truth knowing nothing outside of us, even the everyday challenges and suffering and busyness of our responsibilities can take us away from the peace within us. With awareness, we can accept, breathe, and with kindness return to peace within. When things outside of us are tough, the greatest gift we can give is our own stillness and peace within. That calm energy radiates out. “We can never obtain peace in the outer world until we make peace with ourselves” says the Dalai Lama. It’s not easy but it’s the work we are here to do. The more we practice the more quickly we can have the awareness that we are in reacting mind and stuck in thoughts of past or future, ruminating instead of being here now. That is the human-ness of us. It’s natural and how we grow. It’s up to us to return to being, to presence, to peace. Let this meditation help you return to the stillness and peace within you. Understanding and getting in touch with the five elements of nature that correspond with the seasons - wood (Spring) , fire (Summer), earth (Late Summer), metal (Fall), and water (winter) can improve your health. These lie at the heart of Chinese philosophy and are within each of us. There are simple things we can do each day restore and harmonize these elements so we can feel more centered and healthy in body mind and spirit. I write this as on a cold winter day in Chicago. I look out and see snow all around me. Its cold and its helpful for me to allow this season (the element of water) to allow me to slow down. To rest and restore and reflect. I love this truth that our body needs this restoration and so does the earth. I see how nature thrives following these patterns and we can too as humans if we begin to understand it, trust it, and incorporate practices in our day to begin to feel this harmony and wholeness. Making time for each of these things are important and will help us feel better. Fire (summer) - warmth, joy and happiness - take time to laugh. Fire is about warmth, transformation and dynamic, sparkling movement. Summer brings fire through the heat of the sun, long days and energized bodies. Ask the question, how do we make this fun? It’s so important to laugh everyday. Earth (late summer) - nurture yourself - self-care is so important. Represented by those last warm, light-filled days in September and October - just before the cool weather sets in. Take care of yourself. Feel nourished in the meals that you eat. Enjoy and take in whatever you are being nourished by. Nourish your soul and tell yourself you deserve this right now. Metal (Fall) - Take time to breathe. Process of refinement and its resulting products. In this season, it’s time to make sure everything is pure and that anything unnecessary or wasteful is eliminated (especially in our thoughts). What is no longer serving us? We reminded to practice Meditation and mindfulness. If you can’t take ten minutes to meditate, just breathe. Find some inspiration and stillness everyday. Listen to song you love, feel inspired. Water (Winter) - Cold and dark season that is associated with water - the element of tranquility and flow. It's a time of inward reflection, rest and restoration. We are reminded that need water everyday. It’s so important for our bodies as well as getting clear, turning in, and resting. Wood (Spring) - Motivation, drive, and movement. A time of birth and new beginnings. Exercise that wood element. Even if you can’t get to gym, move around, move your body. Allow the energy to flow through you. Making little efforts to find a little more balance with all the elements in our body can go a long way toward better health and vitality. Gratitude is a practice. What we focus on grows. We have to affirm, say thank you, and appreciate what we have now and visualize and say thanks for what we desire to see more of. Even if what we’re experiencing now is small portion of what we want to see more of, say thank you. This practice helps us feel more gratitude and creates greater abundance. Finding joy is in the journey. We never get there fully because it’s always expanding. Practicing gratitude is the gateway to joy. Here are are affirmations across different life areas for you to listen to so you may turn on gratitude and abundance in your own life. Practice at night before you sleep on the morning and throughout the day, pause, breathe, and affirm all that your thankful for and visualize and say thanks for what you desire to see more of. Brene Brown says “Vulnerability is the birthplace of love, belonging, joy, courage, empathy, and creativity. It is the source of hope, empathy, accountability, and authenticity. If we want greater clarity in our purpose or deeper and more meaningful spiritual lives, vulnerability is the path.” We are called to step out of our comfort zone and to do those things are heart desires even if it makes us scared or nervous. Even if we fail, its not really a failure at all, we stepped out and we tried and that is how we grow and evolve. This is the work we are here to do, to keep challenging and growing ourselves into who we are meant to be. To live with more meaning and love and harmony, we have to step out and do something different. We have to choose courage over comfort. There will be critics, the one in our own head, and those outside of us. It's not the critic who counts as Theodore Roosevelt says "Theodore Roosevelt "It is not the critic who counts; not the man who points out how the strong man stumbles, or where the doer of deeds could have done them better. The credit belongs to the man who is actually in the arena, whose face is marred by dust and sweat and blood; who strives valiantly; who errs, who comes short again and again, because there is no effort without error and shortcoming; but who does actually strive to do the deeds; who knows great enthusiasms, the great devotions; who spends himself in a worthy cause; who at the best knows in the end the triumph of high achievement, and who at the worst, if he fails, at least fails while daring greatly, so that his place shall never be with those cold and timid souls who neither know victory nor defeat." So take the first step. Do the thing that scares you. See how new pathways open up and you are on the path to more meaning, love, wholeness, and harmony. Loving kindness meditation helps us to strengthen feelings of kindness and connection toward our inner self and others. Take a moment and breathe and listen to this meditation to ground yourself in this natural feeling of love that is always available to us. Love and peace is our essence. As we forgive ourselves and others, we may return to this feeling of acceptance and love. This practice is a wonderful meditation to ground and center. May you feel love. May you feel loving kindness. May you find true peace in your life. Our feelings and emotions are our measuring tools. They are energy in motion. We want to become aware of them and let them flow. The way we show up - our energy is important. We can always pause, breathe, and recenter, which allows energy to flow through us in a calm way. The source of energy is attention. What are we paying attention to? Flowing is abundance, creativity, love, peace, joy. This is our essence and what we are meant to feel. When we become more emotionally aware, we can move through our experiences and feelings with greater acceptance and calm. An emotionally only lasts 90 seconds. Whatever it is, feel it, and move through it. Technique to move through tough emotion: RAIN by Tara Brach Recognize whatever it is you are feeling. Allow and accept the experience without judgment. Investigate the feeling with kindness and curiosity as an observer. Nurture and nourish yourself for whatever you felt. Give yourself kind words and love. (More on this at tarabrach.com.) Every Day Every moment we can start fresh. The more we practice the more aware, present, and in the moment we can become. When we are present we are in our essence -we flow with love, peace, joy, creativity - all the good stuff. The more we practice the more we feel it. 06: Today or Never. If not now, then when? In Mary Poppins returns, she says today or never. It’s something we can think about and use in our life to not procrastinate and to do the things that are truly important to us. There are always distractions outside of us and inside in our own heads-our worries and fears-that prevent us from being in the moment and doing what we really desire, what brings us lasting happiness and fulfillment. Use this recipe to take a couple moments each night to think about what you did that made you feel good and take a moment to write and intention for what you truly desire to do tomorrow. It helps us actually do it instead of putting it off until tomorrow and tomorrow and then never. We can always breathe and return back to this moment and get in alignment with our inner voice that is always guiding us and one way to remember to tune in and do what is most in alignment is to say: Today or Never and if not now then when? 03: We are whole, capable, and complete just as we are- this is our essence. We may have lost site of ourselves as whole, capable and complete beings- that feeling of harmony and flow in our being. We have to keep doing the work to bring ourselves back to that level of harmony and wellbeing- the joy is in doing the work. Life recipes share simple practical methods, meditations and recipes for returning to your wholeness across all the important life areas. Health: the way we move our bodies and what we fill it with. Character: our values and what drives the choices we make each day. Intellectually: how we are growing and developing ourselves mentally. Emotionally: how aware we are and in tune with the way we feel inside. Spiritually: how connected we are with the universal world around us, our time in stillness, in reflection, in gratitude and prayer. Vocationally: the work we do, how are we using our greatest skills and talents to serve. Financially: the positive flow of money in and money out. Avocationally: what lights us up, how are we having fun. Finally and most importantly Relationally: how we are interacting and connecting with our own self and others, especially our romantic partner, our children, our extended family and friends as well as the everyday person we meet. All the interactions matter. We are wired to connect with others, and we connect better when all the other pieces are in flow. Environment: what is our space like? Does it spark joy? What systems can we put in place to simplify and create more calm. Join me each morning for a new life recipe in one of these areas. The more we practice and work on each area, the more harmony and flow we will feel. We can always return to our essence through our breath. A huge breath in and out reminds us that we are whole, capable and complete as we are. Be Present Being present is the most natural thing we can do but also one of the hardest. It’s so easy to get lost in feelings and thoughts that don’t serve us; thoughts that do nothing disconnect us from others and the experiences in front of us. The present is where all the good stuff is, but we can’t experience the present when we’re consumed with negative, fear-based thoughts. There’s always some goodness around for us to see and feel. Being present helps us recognize the goodness and appreciate more. HOW DO WE GET PRESENT? Awareness is the first step. Becoming aware that we’re feeling things that don’t make us feel good — like fear, doubt, worry — is the first step to changing them. Next, give yourself one moment of mindfulness, one breath. Focusing on your breath brings you back to this moment. Once you do this, you can choose to think differently. You can choose to think a loving thought instead. ZOOM OUT. When you zoom further out in your mind from your own experience, you can start to see how unimportant the thing you’re worrying about is. Zoom out 10 years from now, will this really be important? Zoom out to see how small this situation is in the footprint of the whole world. How small is the issue when you think about the vastness of oceans, mountains, and space? Zoom out to your life goals. How do you want to live and what you want to accomplish? Is the way you are feeling in alignment with your core values and goals for yourself? Once we are aware and mindful again, we can really feel what you are experiencing again. Be Positive One positive thought leads to countless other positive thoughts, just as negative thoughts lead to countless more negative thoughts. And thoughts do become things. We experience life as we tell ourselves we will. Listen to this and learn more tools to get present. Mindfulness helps us be here now in body + mind + spirit. When we are fully present, we connect with ourselves, others, and the universal power of love and peace. It's within all of us, yet we have to practice in the stillness, returning to our breath, being fully engaged in our activities in order to bring this awareness into our lives. It's easy to be caught up in thoughts in our head about past or future instead of being here now. As we practice stillness, focusing on our breath, reconnecting, we strengthen our attention skills so we bring more awareness to the thoughts and beliefs in our mind that fuel our reactions and behavior. Once you know how to harness and focus your attention—you can get out of your head and into this moment. You awaken your innate ability for happiness, no matter what life throws your way. We create space between our thoughts and our reaction. Mindfulness is one way to achieve greater fulfillment— it’s a set of attention skills that you can learn and grow Mindfulness is like a gym for your mind and it can radically transform your life—leading to better health, more connected relationships, greater productivity, performance, purpose, and creativity. On this episode learn about mindfulness and how you can practice it and begin seeing the positive effects of it in your life and your feeling of wholeness and harmony. Life recipes help us live above the clouds. What does above the clouds mean? Imagine your thoughts and the experiences you face each day as clouds. You can let them clog you, overwhelm you or you can allow them to happen and move through and above them with grace back to clarity, peace, and bright blue sky above. Within all of us is the ability to feel peace and love and harmony. Life recipes help us move through life with more wholeness and harmony and fulfillment. Life recipes are practical methods and affirmations to feel more centered, calm, and connected to ourselves and world around us. Listening to life recipes helps us break down big ideas and execute them in a practical, quick way. Just like a food recipes make cooking delicious foods easy, life recipes make living wholeheartedly easy. By following life recipes—in as little as 5 min a day—we tap into stillness and our essence that guides us into finding meaning in our everyday and wholeness and harmony in our mind, body, spirit, and soul.